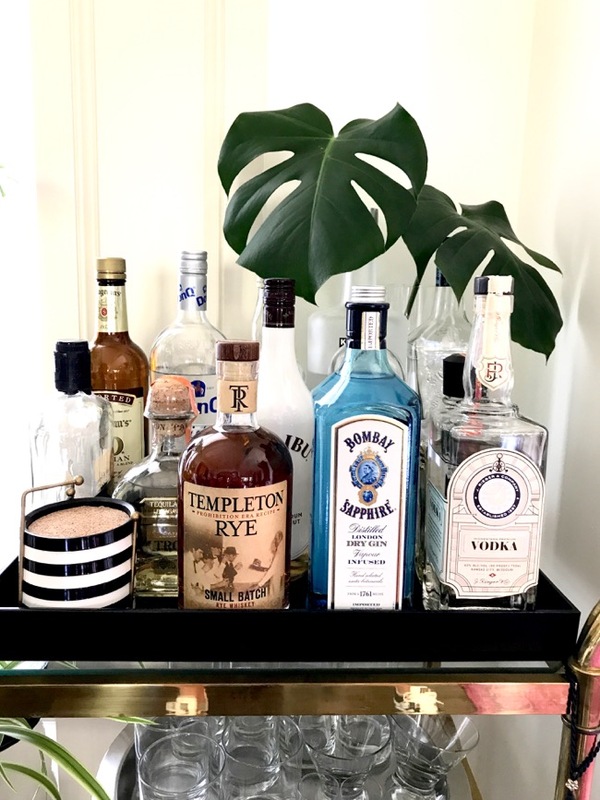 This vintage bar cart is one of my favorite things in our home. It's fun to change up for the seasons. Wood textures and cut stems from plants around my house make it feel warm. 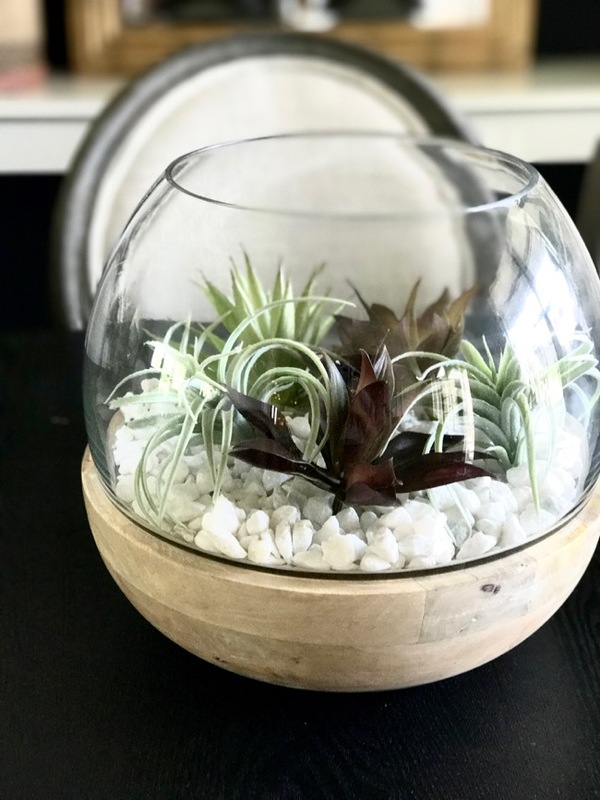 I was recently inspired by another blogger to make this faux succulent terrarium. 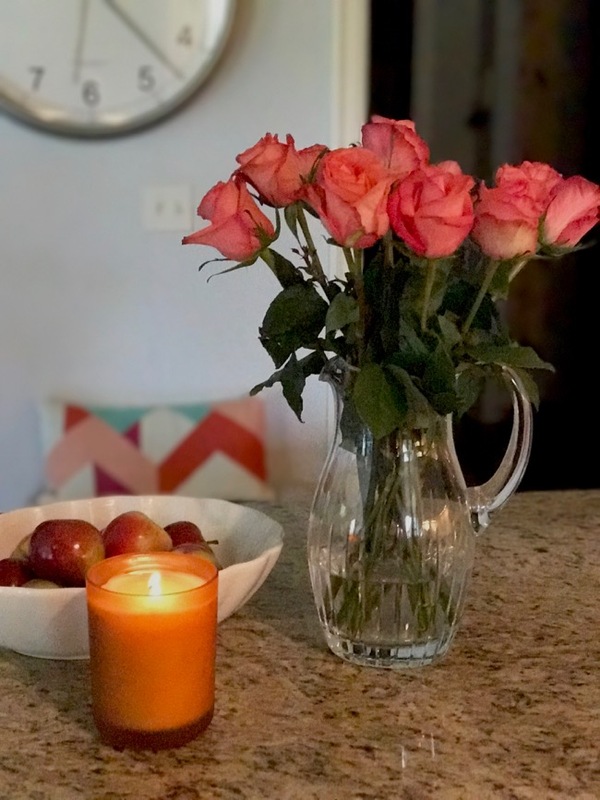 The colors lend themselves to fall and it's the perfect centerpiece for our dining room. I love the look of the wood/glass off of the black tabletop. Our living room is pretty neutral. I changed out blush pillows for wine colored pillows. I love how they look against the ink blue chairs. I also just added this macrame wall hanging. The texture is perfect against the cool paint on the walls. Woven baskets and readily available blankets are a must! I also changed up our craigslist coffee table just a bit. 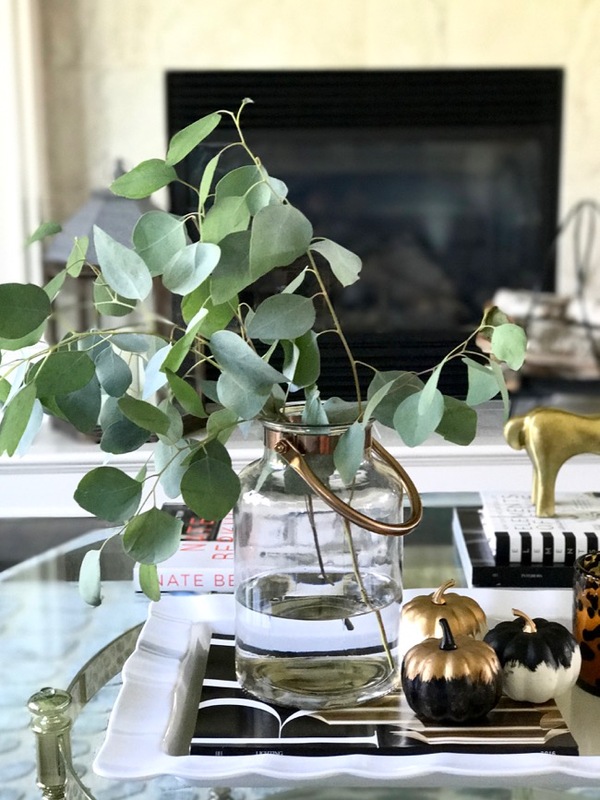 Eucalyptus is so simple and adds a touch of fall whimsy. I decided to leave the navy pillows on our sofa. This shibori pillow is a new purchase and I just LOVE it! 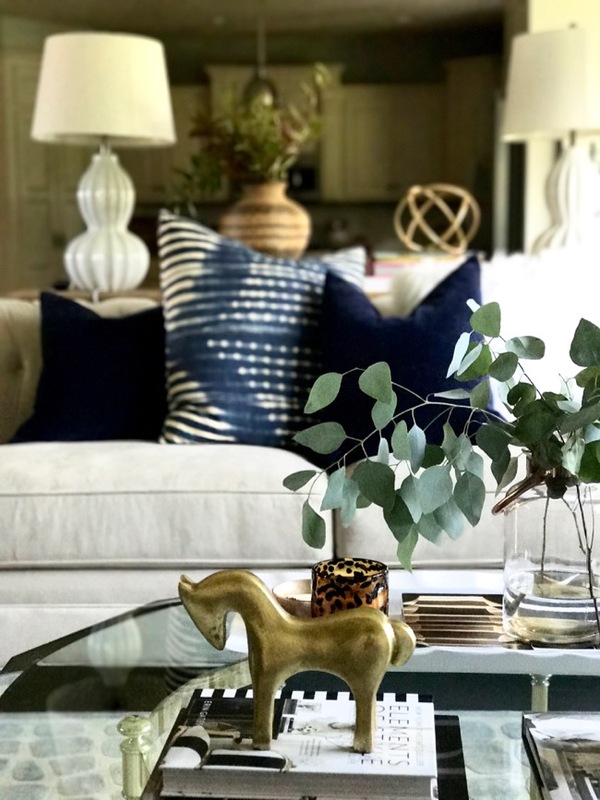 My family calls it the jeans pillow - they just don't appreciate home decor like mom does! Ha! 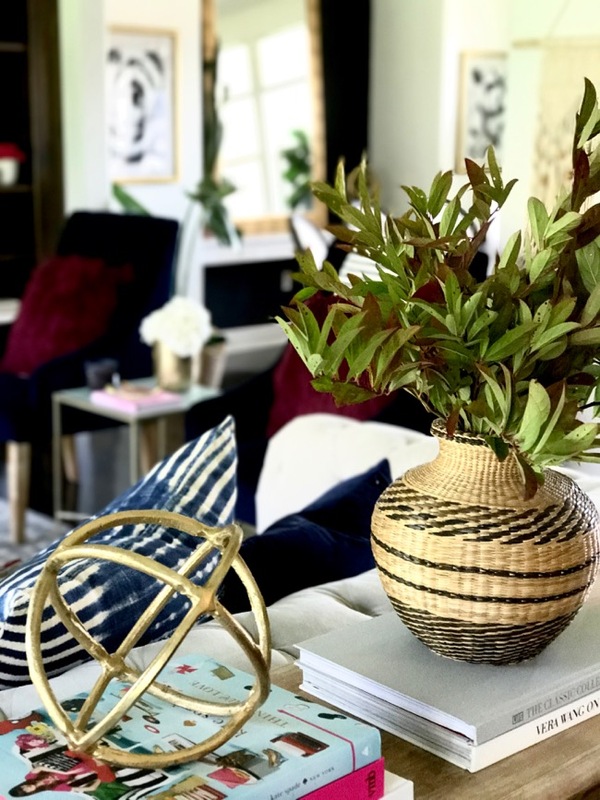 I found this textured vase at a thrift store several years ago an it's perfect for fall! I cut some bush stems from my yard that are just starting to turn color! I love summer/fall because I can cut so many things and bring them inside! And this little sitting nook gets used the most! It's right by a bank of windows and super cozy. 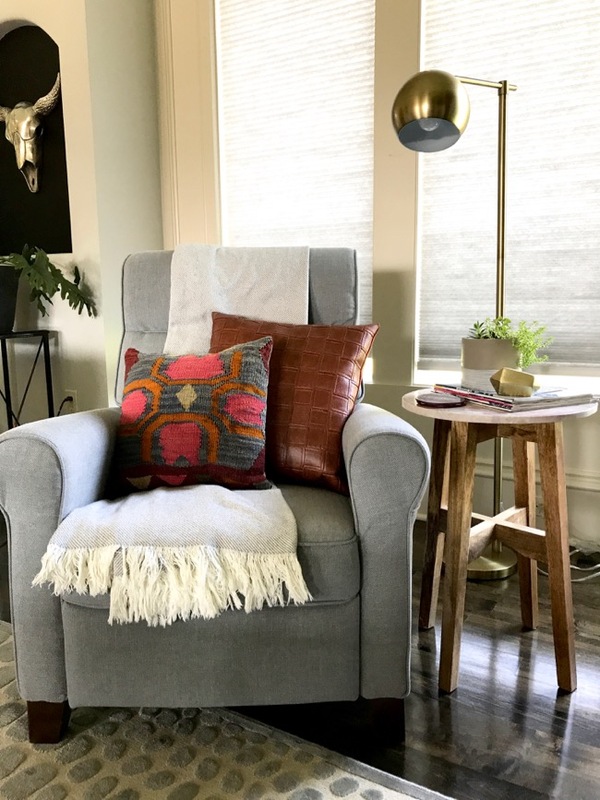 This faux leather pillow really grounds this chair so I leave it here all year long. 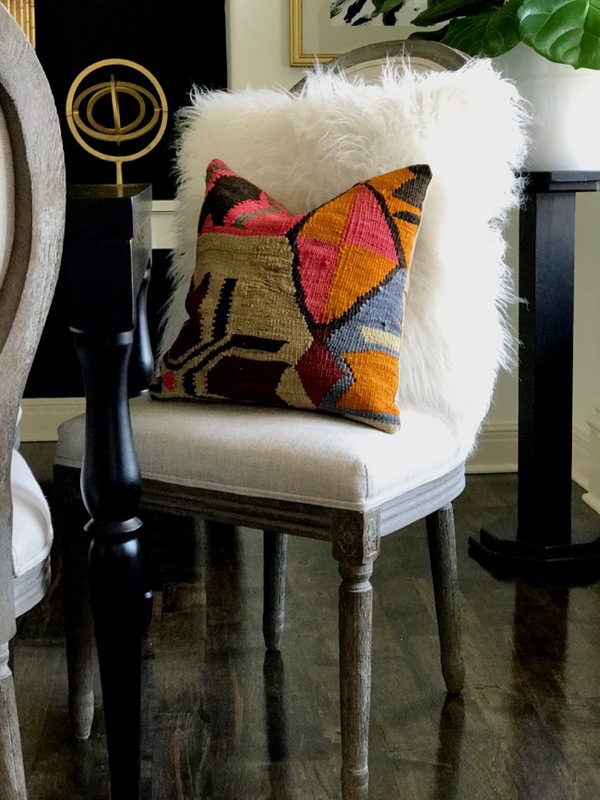 The kilim pillow provides perfect texture and added color to the space! Our master is also very neutral. I added a wine colored pillow to the blush pillows on the bed. The bedside tables also get cut stems from the yard. This pretty sedum lasts forever in water! 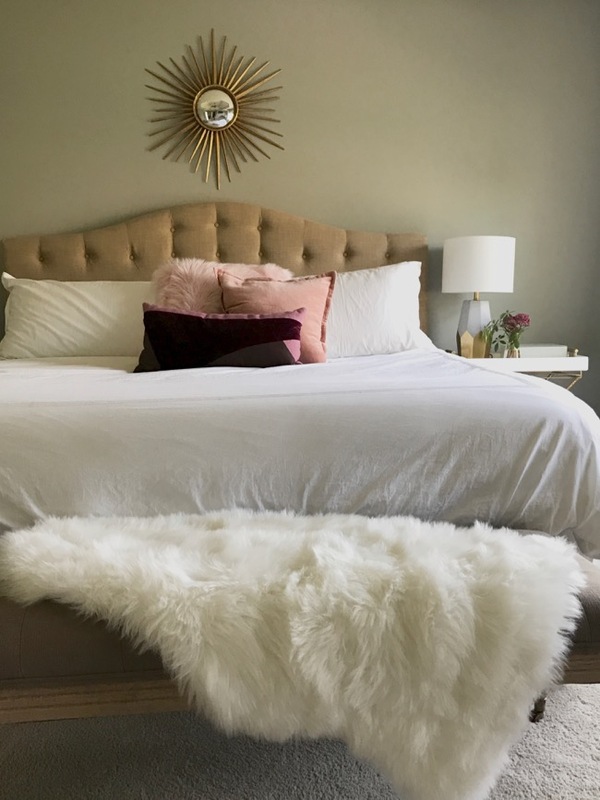 And when in doubt, throw a faux fur on it! I have these things everywhere and I LOVE them! I have been making chalkboard "bucket lists" for 5 years now! It's the number one thing kids and adults comment on when they come to our home. It's such a fun and easy way to add some color and meaning to a mudroom. 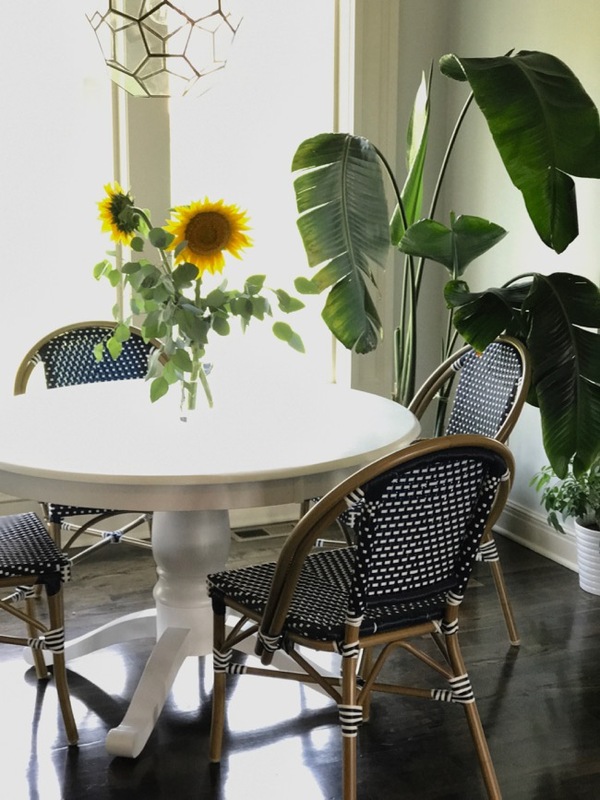 And you can't live in the Sunflower State (Kansas) without having some sunflowers in your home! 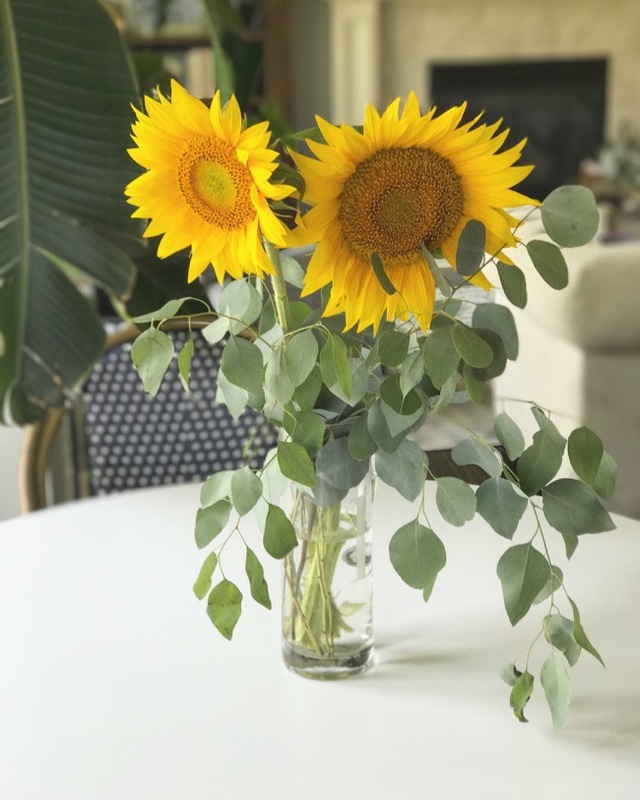 My family recently went to a sunflower farm and we cut these stems (this is allowed and we left a donation)! Paired with eucalyptus, these scream fall! 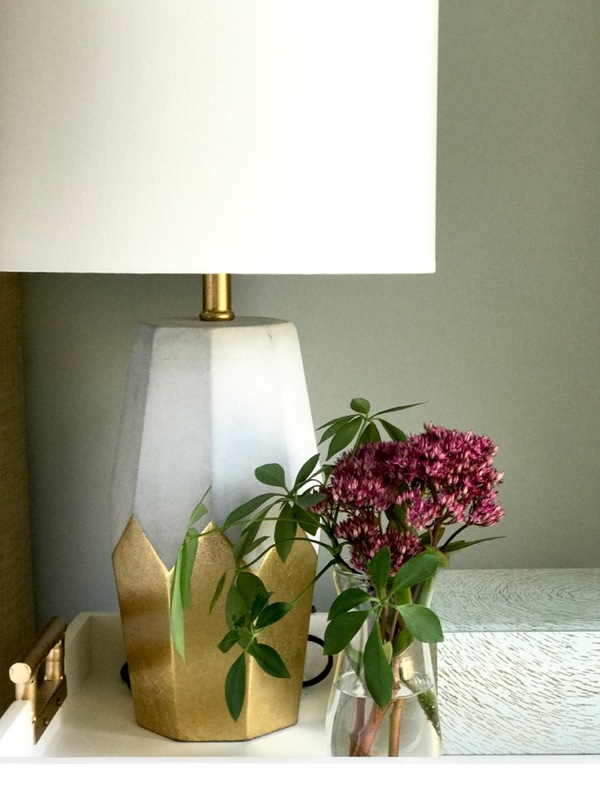 Love them as a table centerpiece! I'm not a pumpkin spice crazy person (I know there are a lot out there! ), but I do love the smell of a pumpkin candle burning. I also love roses. These orange-ish pink ones are my idea of fall! I'm going to do a full fall porch post, but here is one photo that I took right after grabbing some HUGE mums. 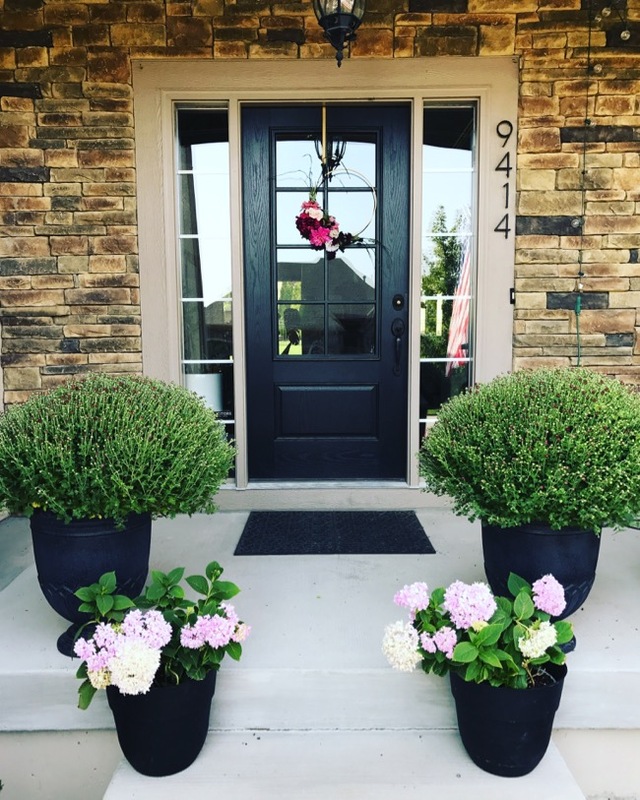 Fall mums and summer hydrangeas collide in September! I think that was a lot of photos! Sorry for the overload! 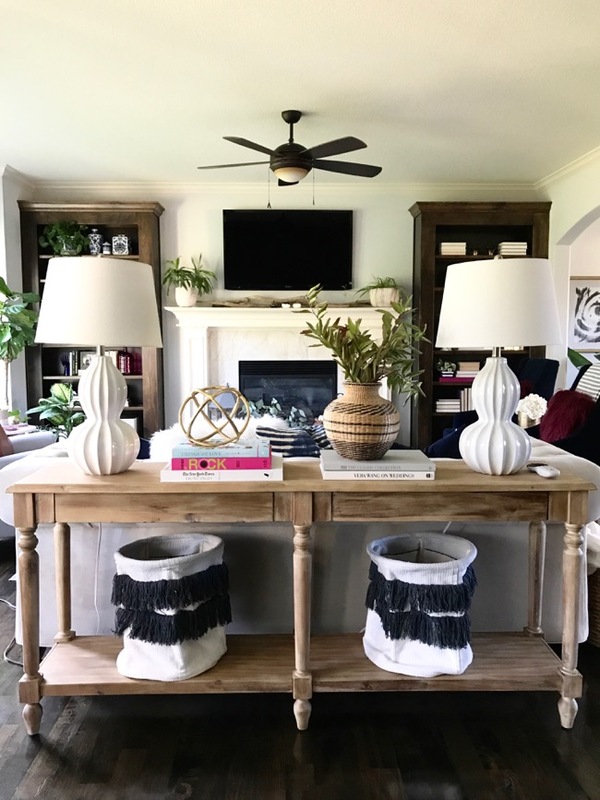 I'm so happy you stopped by my fall home tour and hope you found something that inspired you. Here's to crisp mornings, bonfires, cider donuts, football, sweatshirts and jeans! Don't stop here! 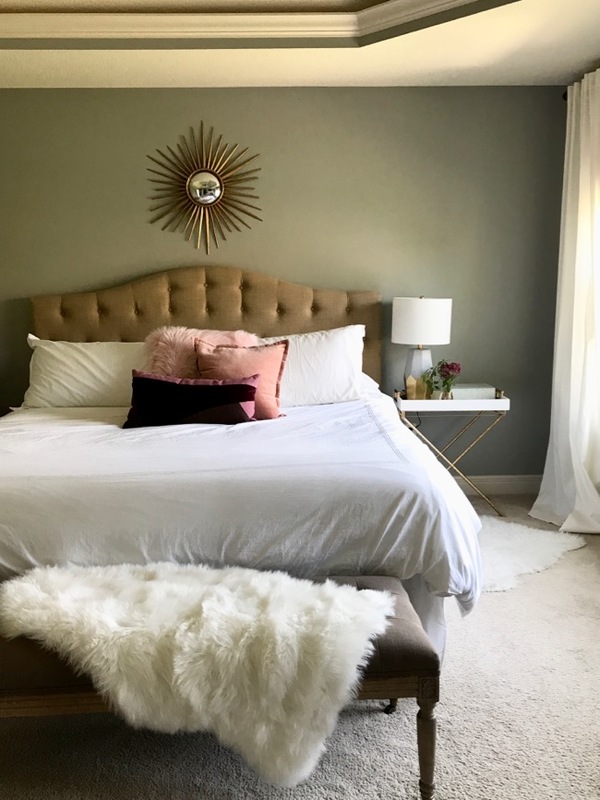 Stop by Remodelando La Casa next on the tour! Click below for all links! Very pretty! Like you, I'm not a fall bin kind of girl but I definitely appreciate the shift in textures and the cozy things we have around us. 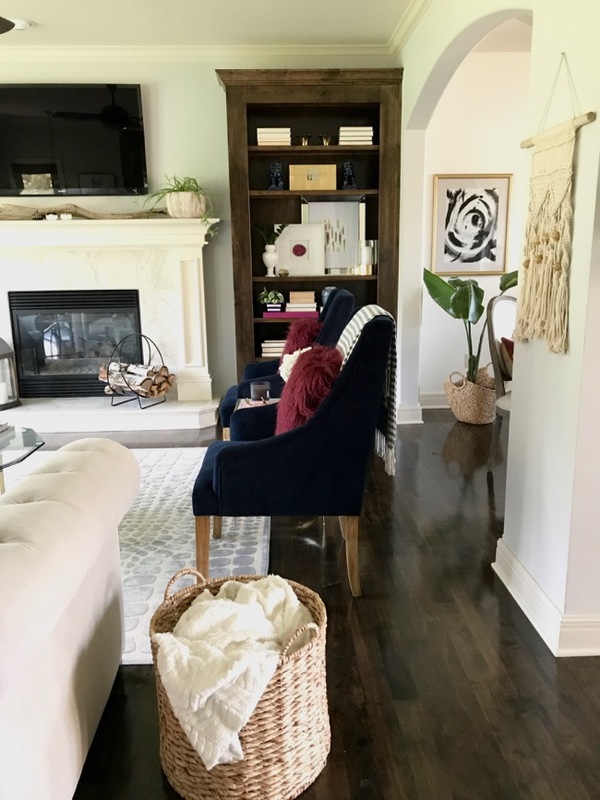 I love all the deep rich colors in your home. 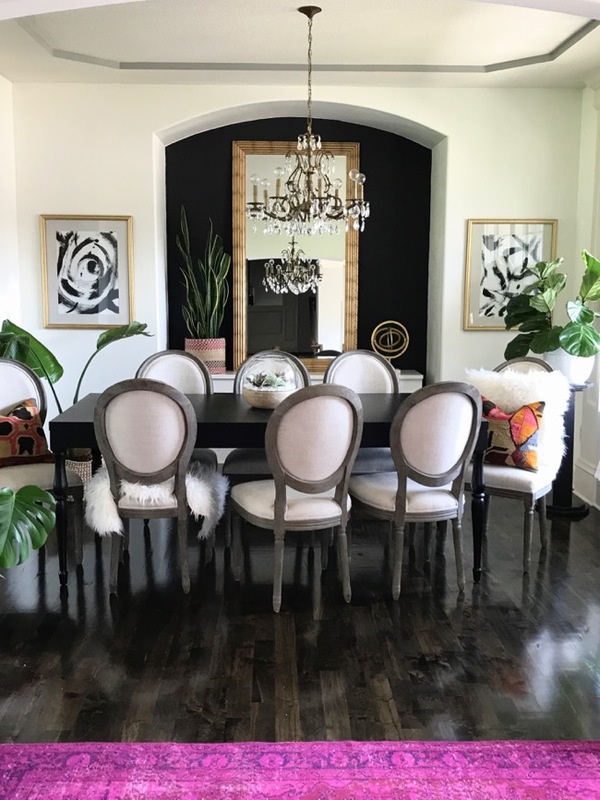 I love your home and the rich deep colors that you accessorize with, so beautiful. Everything looks so inviting and cozy. 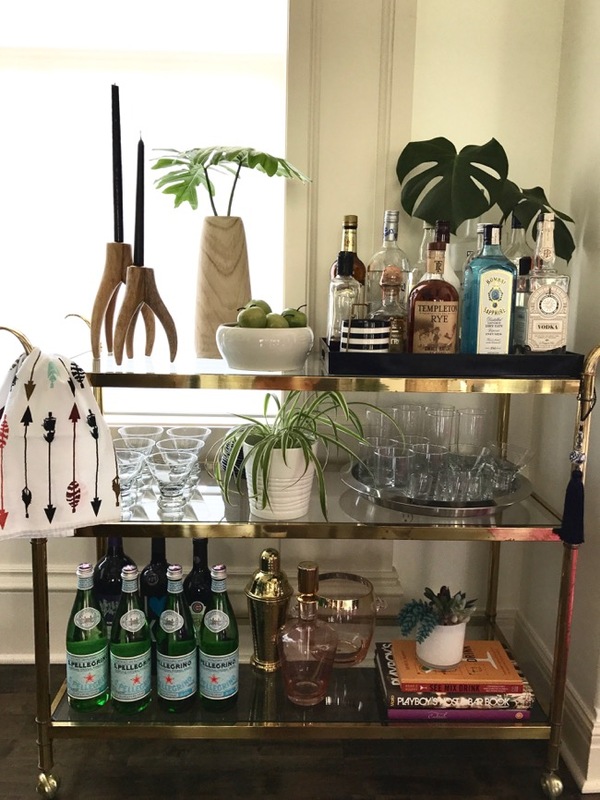 Thanks so much for joining the tours, your home is full of inspiration. 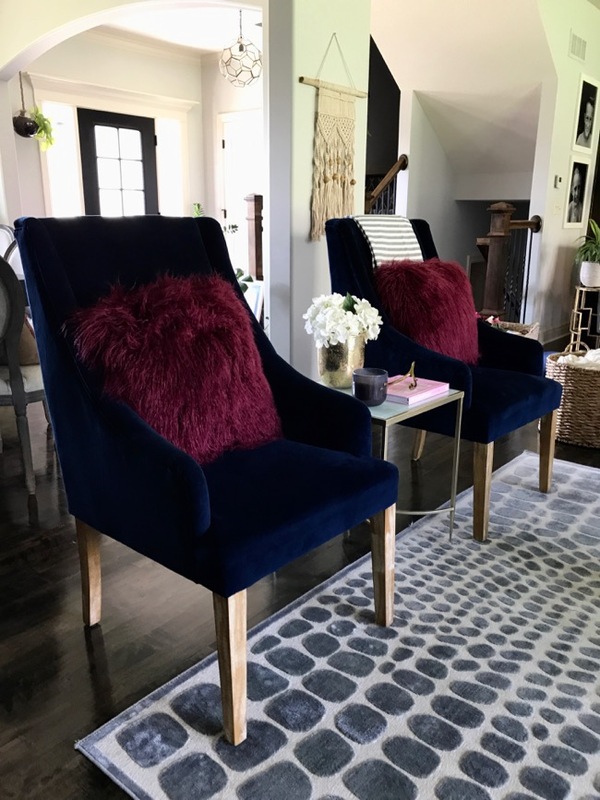 The combination of the berry colored fur pillows against the blue velvet chairs is absolutely enchanting! 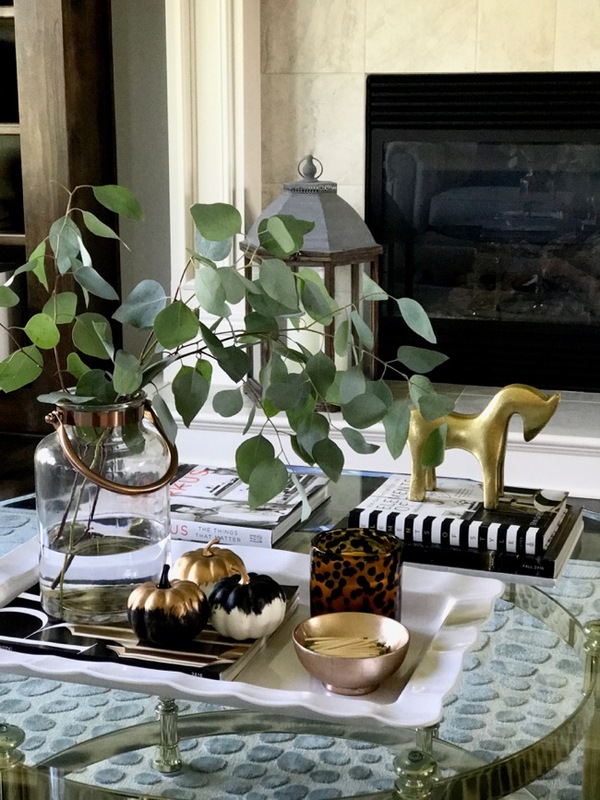 I love your home Andrea and the subtle touches of fall throughout. I'm on the same boat as you, no Fall bins! Love you laid-back Fall style! 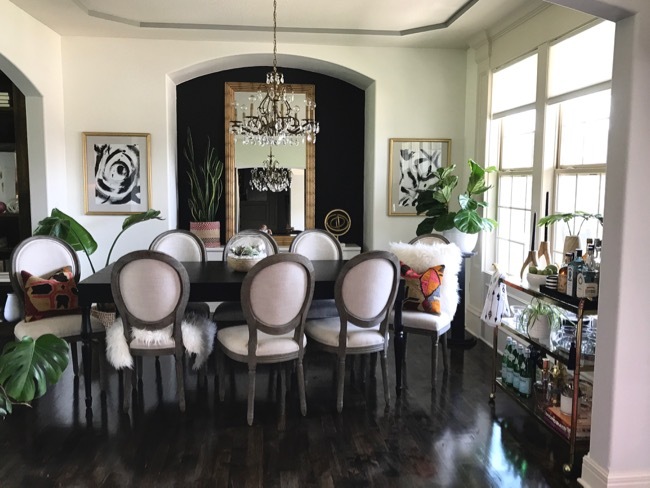 As always, honored to share this Home tour with you Andrea! Cheers! Andrea, your home is BEAUTIFUL! 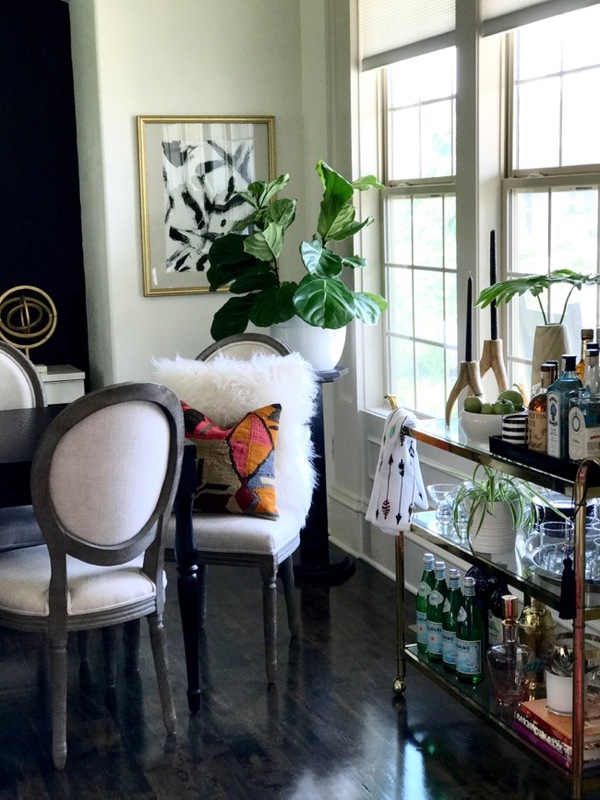 I love your style and touring your Fall home! 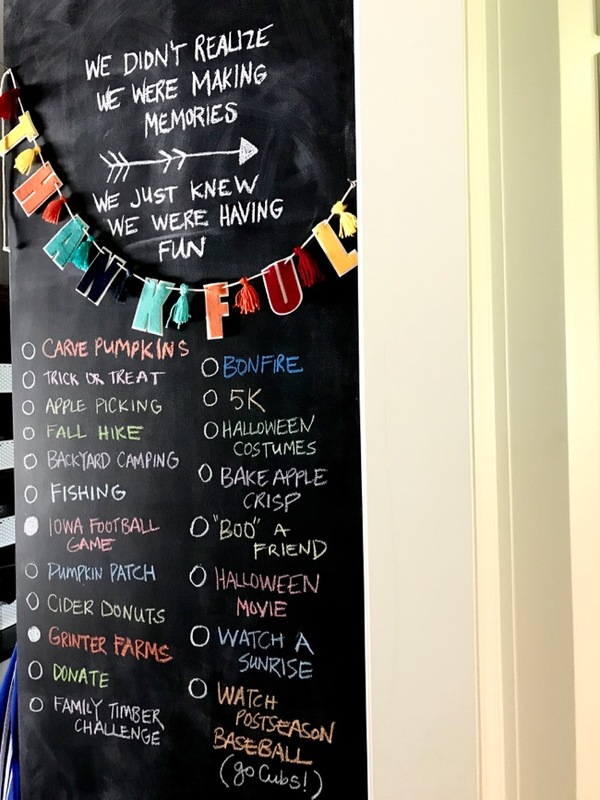 Love the chalkboard bucket list and hey, those pretty sunflowers. I saw your Instagram pic of the sunflower farm and wow, that's just gorgeous. That sure is going to my bucket list. I love your style, it's all so plush! Beautiful! I kind of love all of your accent pillows! I have a pillow hoarding problem.... they are all so bright and colorful for fall! 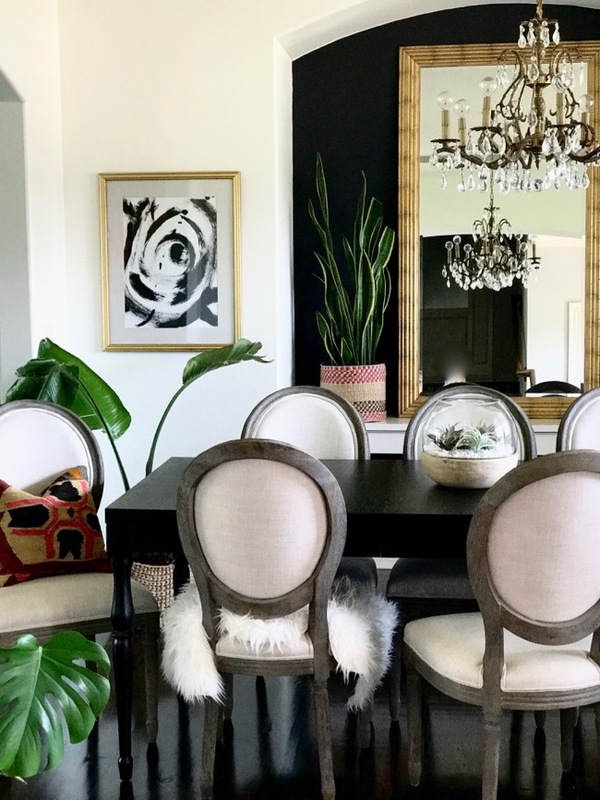 Andrea, thanks for sharing your beautiful home with us. it's a great example of how you can incorporate natural elements to usher in the fall season....and can leave those bins in the attic.